Austin Top 50 Fun in the Sun: Want to create a Summer Bucketlist for the family? If you haven't already, create a Pinterest account - it is free. 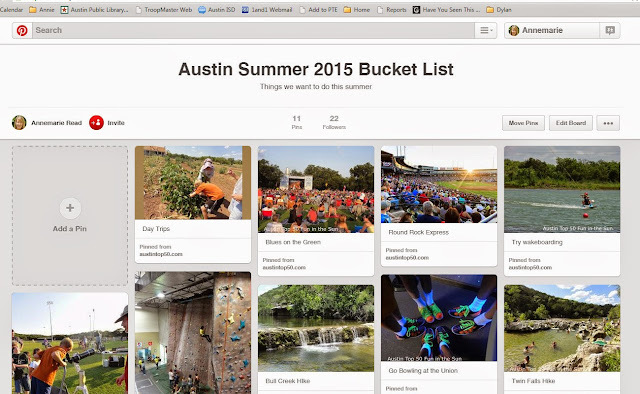 Create a board within your account for Austin Summer 2015 Bucket List ... or whatever you want to call it. Go through the Austin Top 50 list with your kids, and for every item that looks like fun to them, click on the red pinterest button to add it to your list. You have the option of editing the pin with your own title. It can just be the name of the place, like "Zilker Musical!" or it can be something more personal like: Johnny's first pick. Then, on a day when you have time and nothing to do, pull out the list and pick an item!